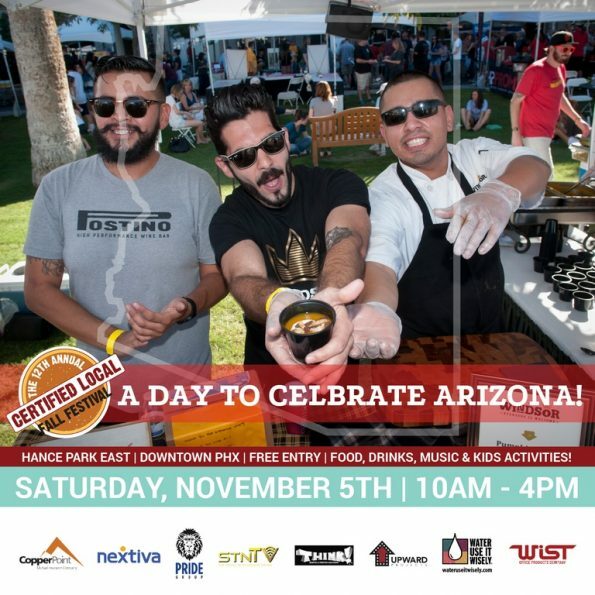 The 12th annual Certified Local Fall Festival presented by Local First Arizona will be held at Margaret T. Hance Park in Phoenix, Arizona, on Saturday, November 5, from 10:00 AM to 4:00 PM. This marks the third location for this annual festival as the annual celebration of Arizona’s local businesses continues to grow in popularity. The Certified Local Fall Festival began at the parking lot of the Duck and Decanter at 16th Street and Camelback in 2005. From there, it moved to Portland Parkway in downtown Phoenix in 2013 to accommodate larger attendance and increased vendors and activities. Just three years later, the festival is making a new home at Hance Park. The Certified Local Fall Festival is a free family-friendly event for all ages and an annual celebration of all things local to Arizona. The Festival highlights everything that Arizona has to offer, from one-of-a-kind local shops, boutiques, and restaurants to Arizona-made wine, beer, and spirits. This year’s festival will feature more than 100 vendors with some of Arizona’s favorite local businesses; food samples from some of the best Arizona restaurants and food trucks; the Hensley Beverage Garden featuring Arizona-produced wine, beer, and spirits; live entertainment from some of Arizona’s most talented musicians at the Entertainment Stage; crafts and activities for kids and families; a raffle with gift cards and prizes from local businesses; an online silent auction featuring items and experiences, along with staycation packages across the state; and much more. Where: Margaret T. Hance Park, Phoenix (Near Moreland Street between 1st and 3rd Streets). Cost: Free to attend. Tickets for food sampling and activities will be available for purchase. Vendors will be selling products and services. The 2016 Certified Local Fall Festival is made possible through support of Nextiva, Social Television Network, CopperPoint Insurance Companies, Think Graphic & Printing Solutions, Water Use It Wisely, Wist Office Supplies, Pride Group, Upward Projects, and Duck and Decanter. More information can be found and will be posted at http://localfirstaz.com/fall-festival/. Guests can RSVP on Facebook at https://www.facebook.com/events/107166869726702/. The official event hashtag is #LFAFallFest. Founded in 2003 by Director Kimber Lanning, Local First Arizona (LFA) is a statewide non-profit organization working to strengthen communities and local economies through growing, supporting, and celebrating locally owned businesses throughout the state of Arizona. LFA seeks to promote, support, and celebrate a vibrant and sustainable Arizona economy by educating consumers, stakeholders, business leaders, and policymakers about local business ownership, social equity, cultural diversity, environmental kinship, and collaboration. Visit www.localfirstaz.com for more information and a directory of nearly 3,000 locally owned businesses.